Tired of the cheaper drones with limited features and capabilities? Want a little more bang for your buck, such as recording and VR computability? Or perhaps you want better play time and want to perform some sweet aerobatic maneuvers. Well, for a little more edge to your drones, you might need to invest a little more. Check out our list of the best drones under $100. But, before that, let’s see why you would want to buy these mean machines! Holy Stone is getting pretty good at making solid drones, the HS160 is no exception. The HS160 is my top pick of the best drones under $100 list. The modular battery design is cool so you can quickly swap them out when needed. The 720 HD camera takes nice quality videos and pictures with the built in wifi streaming to your device. Why Are These Drones Better Than the Cheaper Ones? Camera: Almost all of the more quality drones have at least a 720P HD camera. This allows you to take the most perfect photos and videos. Some even come with Wi-Fi to allow you to upload these precious memories on to cloud storage. With cheaper drones, you might not get a camera at all. Even if you do, they are mostly low quality such as 0.3 MP or 480P. Battery: Cheaper drones have low battery life and higher charging times. Think about it: You will only get to play for 5 minutes before putting it back on charge for hours on end. With these drones, you get at least 10 minutes of flight time with some even exceeding 25 minutes. Build: One crash and you’re done! That is mostly the case with cheaper drones since they are made of cheaper quality and can break on impact. However, with the more expensive drones, you will find them to have a sturdy and durable build that can survive the more intense crashes. How to Choose the Best Drone under $100? So, you decided to invest more in a quality drone, yet you are still confused about how to make sure your investment is safe. The first factor to consider is the build and design of the quad. Drones can crash due to many reasons, so look for the most durable materials. Normally, they are made of ABS plastic material which provides sturdiness and durability to the quad. Next, consider the battery life of the drone. There would be no point in playing it for a few minutes. Look for drones that offer at least 10 minutes of playtime and can charge fully in less than an hour. Go for batteries with higher capacities evident by the mAh rating. Anything more than 500mAh is suitable. The control range of the drone is another important factor as well. Ensure the drone provides at least 80 m of freedom when it comes to the transmission range. This allows for better control without the fear of losing the drone. When you are investing such a significant amount on a drone, ensure it has a high-quality camera as well. A wide lens camera is preferable with a video quality of at least 720P. This will allow for the most stunning photos and videos. Also, ensure the drone comes with a Wi-Fi or an SD card that allow you to store your photos and videos and transmit them. Headless Mode: headless Mode allows you to fly the drone in any direction without the need of repositioning it. One Key Return: This function returns the drone to its original place, ensuring you never lose your drone. One Key Flight: This feature allows you to fly or land your drone with the press of a single button. This means you won’t have to worry about practicing how to land or how to initiate flight. Altitude Hold: This feature never lets your drone crash. You can easily let the drone hover at a set height without worrying about it crashing to the ground. These features ensure easier flight and make beginners fly like experts. Ensure your drone has at least some of these functions. Ensure your drone can easily perform stunts without toppling over in the wind. Most $100 Drones can perform at least the most basic stunts and flips. Some even have a one key flip button that allows you to perform various stunts at the press of a button. Now that we have an idea of what features and capabilities a drone in this price range should have, let’s take a quick looks at the best drones under $100. The Holy Stone is one of the most commendable drones that you will find under $100. It is perfect for professional photographers and videographers as well as drone enthusiasts. Featured is a 720P HD Camera that allows you to take the most breathtaking photos and videos. The Wi-Fi system ensures you can store these media on your phone and on cloud storage. The Wi-Fi has a range of about 30 meters. Further, the drone is 3D VR compatible as well. You certainly won’t find such an excellent quality camera on cheaper drones. With the push of a single button, you can easily fly or land the drone. The One Key Start Function makes it perfect for all levels of pilots. The Holy Stone runs on a 3.7 V 500mAh Li-Po Battery with a charging time of about 50-70 minutes. However, the playing time is merely 7-9 minutes. The transmitter is a 2.4 GHz with a range of about 50-70 meters. The Holy Stone is perfect for all levels of pilots, its HD camera and innovative flight features, make it an enviable product in the market! Easy operation due to Gravity Sensor and Altitude Hold. 720P HD Camera and Wi-Fi Streaming. Features one key flight/landing function. Perfect for beginners as well as professionals. When it comes to expert drones for expert kid pilots, nothing can match the Force1. It’s sleek design and innovative flight features ensure this drone remains a cult favorite! 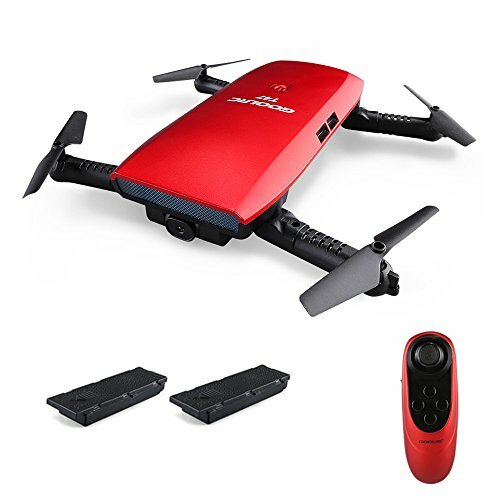 The spotlight is perhaps on the 720P HD Camera that includes a 4 GB Micro SD card so you can store and download the most stunning aerial photos. What makes this drone more expensive than others is that it can perform full 360 degree flips in the press of a single button. This is why it is so popular amongst beginners and kids. Also featured is a super steady flight thanks to the 6 Axis gyro systems. The headless mode allows for safer and easier flight as well! Another kicker feature that justifies the price point is the dual battery (3.7V 500mAH Li-Po that allows up to 18 minutes of flight time! Further, it features a 2.4 GHz transmitter with a signal distance of about 325 ft. The Force1 is certainly worth every penny for those beginners who want easy features without compromising on the ‘wow’ factor! 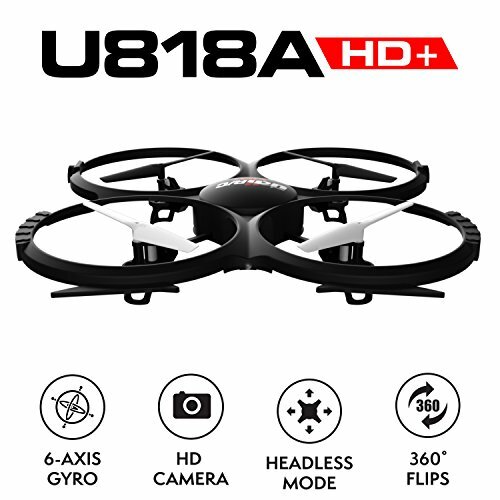 For a more expanded look of the UDI U818A drone, check out Mark’s review over at Droneista.com. The headless mode allows for easier flight. Single button press flips and tricks. 720P HD camera with SD card. 18 minutes of ample playtime. The quad is too light and ends up getting caught in the lightest of breeze. The RC drone by SJJX is one of a kind foldable drone that allows the quadcopter to be portable and easy to store. Its price is matched by the 120 degrees wide angled lens and the 720P HD camera that ensures you capture the most stunning videos each time. The WiFi transmission system allows you to upload your videos and photos. Furthermore, the SZJJX is VR compatible. 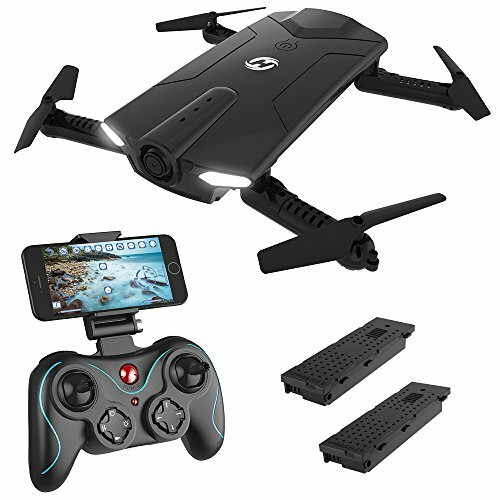 Another great feature is an altitude hold function and the 3-speed levels allow users of every level of expertise to fly this drone without worrying about crashing it. The Headless Mode allows you to fly the drone in any direction your heart desires. Another key feature is the one key landing and flight function that allows you to take off in the press of a single button. The battery included is a 3.7V 900mAh LiPo with a charging time of 90-120 minutes and a play time of about 10 minutes. The 2.4 GHz transmitter has a long range of about 150m. All in all, The SJJX’s RC drone is the perfect match for beginners as well as seasoned professionals! WiFI transmission system and VR compatible. Headless mode and One key Landing makes the flight easier. Altitude hold function allows you to hover easily. The long signal range of about 150 m.
Small play time of about 10 minutes. Another gem from Holy Stone is the F181C with exceptional quality and stunning performance. It is specifically designed to serve both beginners and professionals who are looking for an extra ‘oomph’ factor in their drones. The main feature is the 3d Rolls and flips that allow you to do all kinds of tricks and stunts to wow your friends. The best part is that these stunts can be performed with the press of a single button. Also included is a 720P HD Camera that allows you to fulfill your dreams of aerial photography. The One Key Return function, one key flight function, altitude hold and the headless mode ensure an easier flight. The best feature is that it has a dual battery, each a 3.7V 750mAH LiPo that allows a total playing time of about 7-10 minutes while the charging time is 70-90 minutes. The 2.4 GHz transmitter has a long range of 100 meters. However, the question is “Are all these features worth the price point?” The answer is a big YES. The HD camera and the easy flight operations such as Headless mode, altitude hold, one key functions make this the best drone under $100. 3D flips and tricks with a single button. Features one key return, one key flight, and headless mode. Altitude hold allows you to hover at a set height. When it comes to drones with impeccable quality along with a reasonable price, none can match the GoolRC T47. The GoolRc is equipped with a 720P HD Camera with the real-time Wi-Fi transmission that allows you to store your stunning photos and videos immediately. The transmission range for the WI-Fi is 30m. You won’t find such a high-quality camera in cheaper drones. Next comes effortless flight controls such as the Headless mode, one key flight and the Altitude Hold functions which makes even the most clueless of beginners look like seasoned professionals. The GoolRC runs on dual 3.7V 500mAH LiPo Batteries that allow a playing time of 7 minutes and a charging time of 70 minutes. The 2.4 GHz 4 channel transmitter ensures an interference-free transmission to about 80 m.
Also featured is a foldable and portable design that lends it a modern sleek look. All in all, the goolRC is perfect in terms of design and functionality. You won’t think twice about the price after actually flying it! WiFI Streaming and 720P camera. Features include headless mode, one key flight and altitude hold. Ergonomic and Unique Wi-FI remote control. This outstanding RC Drone by GordVE looks like something straight out of an action movie! Its sleek and smart design is only paralleled by its easy to use flight operations. 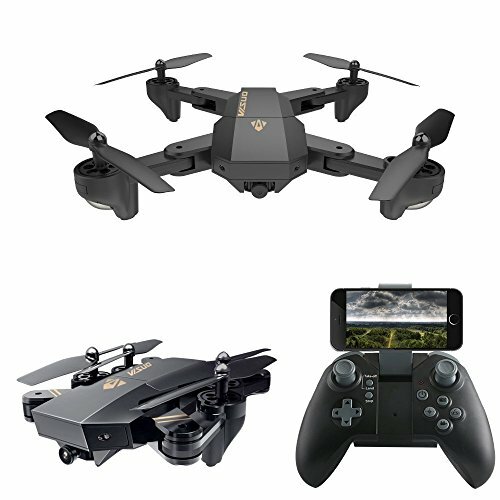 What you might not find in the cheaper drones is the ultra high definition 720P Camera equipped with a 120 wide angled lens that allows for the perfect pictures and videos. The drone is VR compatible as well. Another unique feature of the GordVE is the Customize route mode. You need only download the app and design your own flight path. Then sit back and watch your drone fly the perfect loops and stunts. Also featured are the altitude hold function, the one key return function, and the headless mode. Recall your drone, rev it up, hover it around or simply land it in the easiest way possible. The charge time is about 90 minutes while it lasts for at least 10-15 minutes. Customize route mode to design your own flight paths. 720 P HD camera with 120-degree wide lens. Can perform stunts and tricks easily. So, all in all, while these drones are a bit more expensive, they will serve you better than the cheaper drones. They are definitely worth every penny. However, if we had to choose the absolute best drones under $100, the Holy Stone HS160 leaves others miles behind! Its 720P HD camera quality when paired with its easy to use flight operations is what lands it on the top. 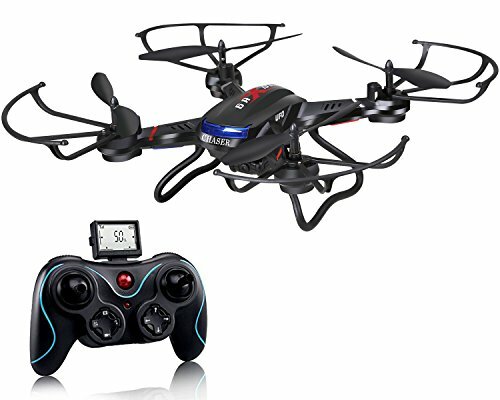 Its long transmission range, VR compatibility, and durability will ensure you never get bored of this amazing drone!